Shooters who demand and achieve outstanding results also understand where those results come from. World beating performance is not the result of any single factor, but the successful combination of many. It begins with the selection of equipment capable of the performance you need, and ends with your ability to use that equipment to its full potential. Between the precision of the hardware and the skill of the shooters lies a single, essential means of translating potential into success - and thats the pellet. Its the pellet you shoot that ultimately determines whether you hit the target, or not. Once that pellet leaves the barrel, you have to trust it to deliver everything invested in your shooting system. Thats everything from the technology, care and craftmanship invested in the development of every component in your airgun, through more of the same devoted to your sight and mounts, to the hours of dedication required to make you an efficient shooter. All of it rides on the head of that pellet, every time you fire a shot. Expert airgunners understand this fundamental fact of shooting life, as much as they know the folly of creating any other weak link in the performance chain. The best always use the best, especially when it comes to pellets. At Air Arms, we research everything. Each component, product and accessory that carries our name has earned its place by being the best at doing what its designed to do. That applies to Air Arms pellets; not just because thats the way we do things at this company, but because we know that our pellets are responsible for the delivery of the Air Arms performance promise. 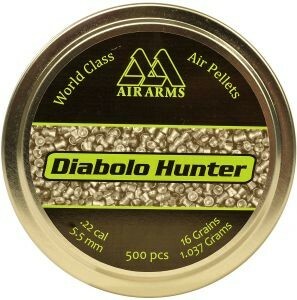 Our pellets have to be top quality, because they prove how good our airguns are. 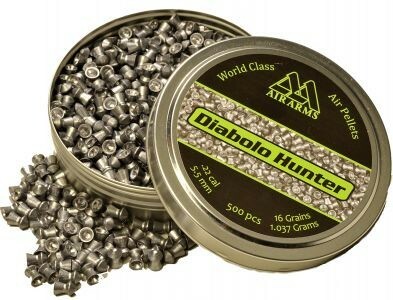 All Air Arms pellets are precision formed for ultimate consistency and accuracy you can trust. Hunters, field target shooters and airgunners who appreciate quality will see for themselves why our pellets produce such outstanding results. These pellets reflect the Air Arms philosophy of precision, top performance and full potential - and thats why so many of the worlds best shooters choose them. By becoming an Air Arms customer, you share our commitment to quality and our vow to produce the best possible performance. Please maintain that commitment by choosing the finest possible pellets for your airgun - made to our standards, for your success.